PC Gaming – Page 1139 – A world of gaming information. In 2010, GameSpot’s Game of the Year was none other than Red Dead Redemption. Eight years later, that game remains one of our all-time favorites, and leaving John Marston behind to step into Arthur Morgan’s story wasn’t easy. Red Dead Redemption 2 ended up being everything we could have wanted in a prequel, but it’s also a moving, often heartbreaking, and oddly hopeful story that stands independently of its predecessor–and that’s only part of the reason why Red Dead 2 is GameSpot’s 2018 Game of the Year. It’s fair to say that Red Dead Redemption 2 faced incredibly high expectations. For fans, there was the matter of how to follow the original Red Dead Redemption. More generally, there was the simple fact that GTA V, Rockstar’s previous game, is among the most successful entertainment properties of all time, as well as the promise that Red Dead 2’s open world would be vast and incredibly detailed (including the horse anatomy). Going into Red Dead 2, you’d be forgiven for expecting it to be a big cowboy playground where you can go anywhere and do anything an outlaw might care to do. And in some ways, it is–but it’s remarkable for the ways in which it isn’t. When you first start Red Dead 2, the scope and detail of its world are almost overwhelming. In a series of tutorial missions woven into the exposition, you’re presented with a variety of cowboy-ish activities you can undertake: fishing, horse-rearing, robbing, hunting, and more robbing, plus personal grooming and the need to eat. It’s easy to dismiss the story missions entirely to follow the pastime of your choice, which inevitably leads you to another random activity or a chance encounter on the side of the road and then, before you know it, to a town far from where you are “supposed” to be. Your choices seem endless, the world impossibly large, and the freedom of wandering through it on your horse is too enticing to ignore. Even more impressive is how the world shifts to react to you. Getting into a deadly fight in a bar, for example, doesn’t just put your own honor level at risk; townspeople will remember you for it, and you will not be very popular. An expensive horse gets oohs and ahhs from passersby, while running into someone with your horse will (understandably) make them very, very upset. The world is both fantastic and mundane, populated by criminals and honest citizens alike, and getting a cheery greeting from a random person in the street draws you into the world just as much, if not more, than discovering a serial killer’s hideout or robbing a train does. There’s a point where this sense of wonder and freedom will clash with what the story is doing, and that point may be different for everyone. It might be the mission structure, which often devolves into firefights even if you try your hardest to avoid them; it might be the pacing, which is slow and deliberate and sometimes exhausting; it might simply be the nature of getting from place to place, which, due to limited fast travel options, means you’ll be spending a lot of time with your horse. No matter how you’re trying to play, whether it’s as an honorable Arthur or a terrible one, you’ll often find yourself doing things you didn’t particularly want or intend to do. This is where Red Dead 2 tests your patience, and it can feel like you’re fighting against the game just to play it. But far more than being a detailed, living open-world game, Red Dead Redemption 2 is a focused narrative experience, and you, the player, are not at the center of it. This story belongs to Arthur Morgan, to the Van der Linde gang, and to the death of the Wild West; everything you do feeds that story. The choices you make are not as important as the process of making them, and that’s precisely why the story is as impactful as it is. Arthur Morgan is a man caught between two versions of himself: the man he is and the man he would like to be. He’s caught between his loyalty to Dutch and the doubt that creeps in as more and more things go wrong. The act of playing Red Dead 2, as you’re caught between what you want to do and what you are able to do, brings you closer to Arthur. Your frustration when a mission goes south is Arthur’s frustration; any guilt you feel toward the end of the game, when you’re meddling in matters that don’t concern you, is Arthur’s guilt. There’s an overwhelming sense of inevitability in everything you do, which is exacerbated if you played the original game and know what becomes of the Van der Linde gang. Many of the people you’re building relationships with, you assume, will die before the events of Red Dead Redemption, and the ones who don’t can make you sad for other reasons. But despite that, Red Dead 2’s story is ultimately a hopeful one, and fleeting moments of levity and optimism offer a respite even when you can sense a cruel fate is only a few story beats away. It’s hard to shake the kind of connection you develop with Red Dead Redemption 2’s world and characters. It’s a game that can try your patience, for sure, but it simply wouldn’t be the same if it didn’t. It’s an unforgettable experience that challenges your expectations as often as it meets or exceeds them, and there’s no question that it’s our Game of the Year. The Whisperers are coming. It’s something we’ve known for a while about The Walking Dead and, thus far in Season 9, we’ve gotten lots of teases for the new villains on the show but have yet to actually meet any of them. Well, that changes now. AMC has released new key art for the show’s return in February, which prominently features new cast member Samantha Morton as Alpha, leader of the Whisperers. If she doesn’t look too familiar in the image below, there’s a reason for that. The Whisperers are unlike any other force your favorite survivors have come up against before. They move among the walkers by wearing the skin of the dead over their own. Yes, it’s as disgusting as it sounds and GameSpot will have plenty more details about the new group as we get closer to the mid-season premiere. However, in living among the walkers, it brings the Whisperers a kind of freedom many in this horrible world don’t have. It seems they don’t necessarily fear the dead, which is a powerful trait to have. Morton won’t be alone in leading the group. Sons of Anarchy and Bates Motel alum Ryan Hurst has also joined the cast as Beta, her second-in-command. Together, these two will lead the Whisperers as they attempt to take out the survivors in Alexandria, Hilltop, and the Sanctuary. Unfortunately, it’ll be some time before we find out how successful they are. The Walking Dead returns Sunday, February 10, on AMC. Ace Combat 7: Skies Unknown is flying towards its release next month, and today there is a brand new trailer focusing on the F-22A Raptor. GAMELAB Zrt. scurries into the runner genre with their hand-drawn beauty Wormster Dash. Featuring a giant worm and a healthy dose of danger, should you set out to set a new record? From GameWatcher: “Ring of Elysium has had a batch of players seemingly randomly and most definitely wrongfully banned not too long ago, and developers have already prepared an apology and plans to compensate them for their troubles. Bonnie Ross, Microsoft Corporate VP and Head of 343 Industries, admitted to having made mistakes along the way with Halo since taking over from Bungie. At the same time, she reaffirmed the developer’s intent to do right by the IP and said she is ‘so proud’ of the work that has been done on Halo Infinite. 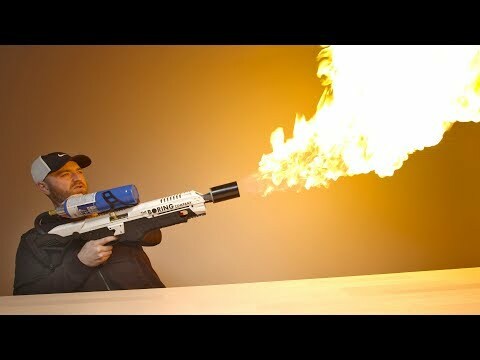 Unboxing the Not-A-Flamethrower from The Boring Company.